Gene Effects is a social media consultancy, specialising in working with biopharma / biotech and life-science companies. Our mission is to contribute missing skills and save time, so that companies can grow their profile online, increase awareness of their brand and drive sales. 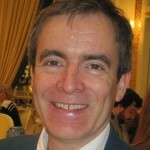 Paul Denny is a consultant with a blend of insight, intelligence and enthusiasm. Drawing on a career working in the lab and at the keyboard, he now specialises in social media for life-sciences.